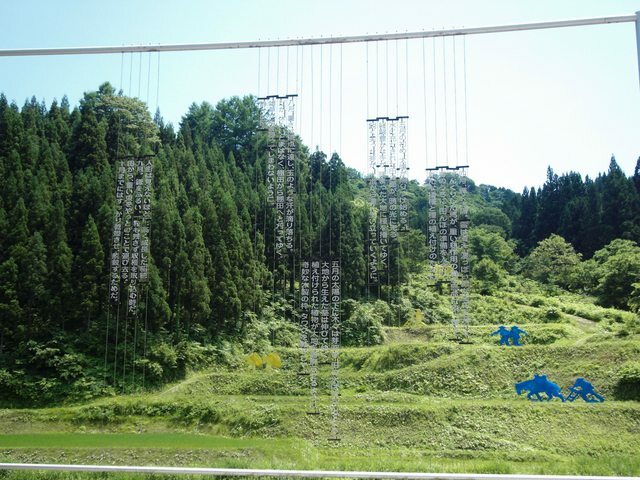 For the last decade, a group of Hong Kong volunteers and artists have participated in Japan’s Echigo Tsumari Art Triennale (ETAT) – the world’s largest existing outdoor art festival. 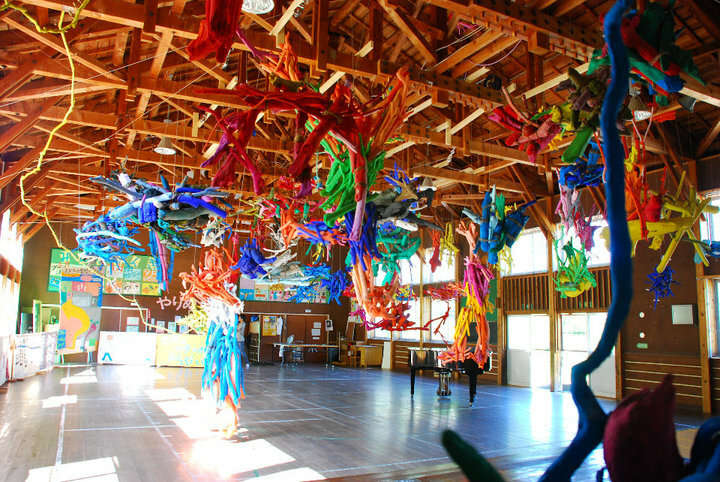 Held in southern Niigata, the latest instalment of the triennial event is expected to attract half a million visitors over a period of two months. There are some who bemoan that the contemporary art world is market-driven and commodity based. For them, a festival like ETAT both looks and feels out of place. Discussions of financial return and prescribed aesthetics are seemingly relegated from the festival’s ethos. 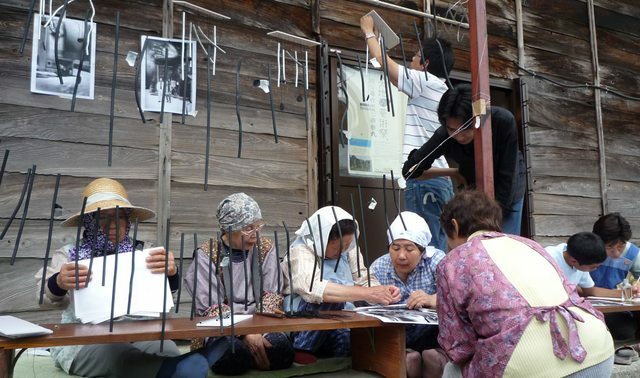 ETAT was initiated in an attempt to revitalise the aging and de-populated Echigo-Tsumari region. It has largely reinvigorated the area, bringing in an estimated 4,650million Yen (293million HKD) in economic benefits. So the time has come to ask: can Hong Kong host its own ETAT, to address the needs of the city? 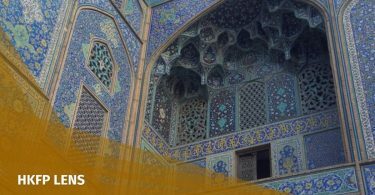 The festival features 367 art installations from 44 countries, which occupy everything from from abandoned houses to riverbeds in an area spanning 760 square metres. 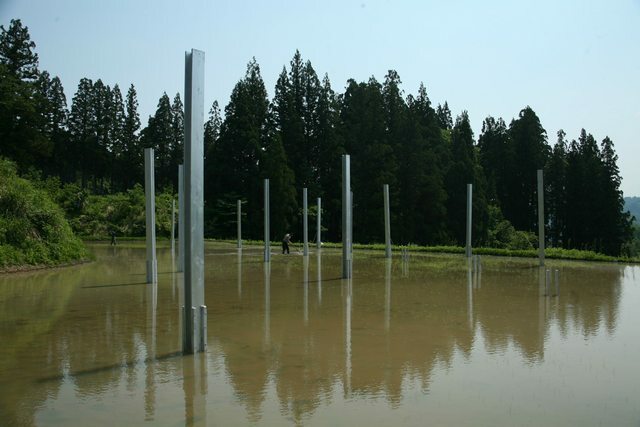 The works commissioned for each festival remain in the area and become part of the landscape. Venturing into the nooks and crannies of the vast landscape, tales of forgotten histories and customs unfold. Take, for instance, The Rice Field by lya & Emilia Kabakov, from 2000 – a large hanging installation of poetry describing the surrounding traditional agriculture. Rightfully situated amongst terraces opposite the No Butai (a traditional Japanese theater) platform, visitors are ensconced in memories, anecdotal histories, and an immersive experience in the region’s environment – an unexpected introduction to the place through the art piece. ETAT commissions art works that revive the physical landscape and community through engagement with local residents and the traditions and culture of the area. This is a particular trait that has continually attracted the participation of Hong Kong arists. 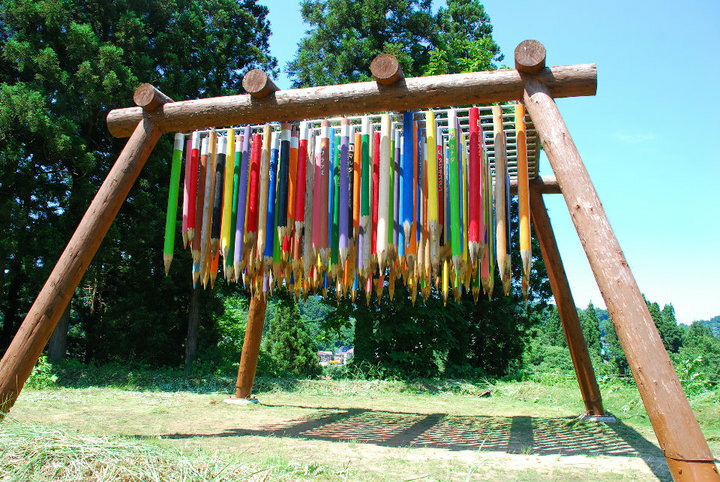 One such artist is Kingsley Ng, who first encountered the festival’s curatorial vision in 2009 with his work Wind Chimes. “I was funded on a one-week site visit by the organisers, during which I learnt about the customs and history of the village I would be working in. I designed the aluminium work to document the palm creases of villagers, and the cracks left in the walls by an earthquake. The works were later installed in every corresponding household in the village. I didn’t feel I was culturally enriching the place, because the place did not lack culture. It was a story, left to be unfolded.” Ng’s experience inspired him to pursue further study in sustainable development and site-specific art. Ng noticed the priority ETAT allocated to the sustainability of the land, its people and visiting volunteers, over the arts, the artists and the organisers. “Organisers put the needs of the village and the villagers first – a practice uncommon in the institutionalised art world. Artists are equipped with their creative means, but such means should be put to use addressing a bigger community problem. 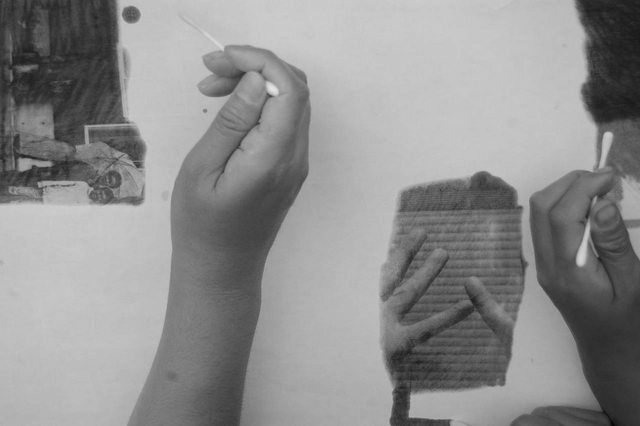 It is necessary for artists to give way to the community.” In a commercial-driven art landscape like Hong Kong, we are left to ponder how this spirit could inspire the current practice. ETAT organises a group of volunteers called the Koehbi (little snake), in tandem with its arts programme. The Koehbi take care of everything from household chores for villagers to art making for artists. In 2006, Hong Kong student James Lam first joined the Koehbi. Lam has returned to the area every three years since. This year, he serves as coordinator for the Hong Kong project Gift from Land by Hong Kong’s Sense Art Studio and the Hong Kong Farmers group. The team involves 24 students from Po Kok Secondary School, amongst others, to run an agricultural initiative at Mastudai. “Our project puts permaculture at the center. It focuses on energy conservation during the farming process, so that nothing goes to waste. The team planted vegetable seeds, tended to rice crops, looked for a sustainable water flow and reused valuable resources that others saw as waste,” explains Lam. In a sense, a project of this nature can only truly take form after repeated involvement, thorough research and through a continued collaborative process – both in and outwith the festival period. Although Hong Kong may be far off hosting its own ETAT, a project similar in scope was initiated in 2013 by Sampson Wong, a former ETAT volunteer. The Ping Che Village School Art Festival was held at the abandoned campus of the Ping Yeung Public School situated in the edge of Northeast New Territories, which was terminated in 2007. Like ETAT, the creative process focused on researching the history of the location, as well as interaction with residents in the surrounding areas. The festival was however, a one-off attempt. While it may have mirrored ETAT in its essence, it lacked the framework and grounding to ensure its sustainability. 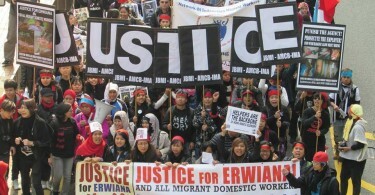 That said, it is perhaps too pessimistic to deny the impact that ETAT has on the potential solution to the rural-urban question in Hong Kong. ETAT’s success lies in its commitment to create a dialogue between the urban and the marginalised without imposing a prescribed set of values on either. The lessons learned at ETAT do not have to materialise into an art festival. As long as we are aware of an alternative model to exploitation, Hong Kong will have its own ETAT one day, in one form or another. Originally published in Time Out Hong Kong. Edited by Amanda Sheppard.